Everyone was just enjoying a friendly game of soccer last August in Beaverton when a teammate went into cardiac arrest. Adult soccer players participating in an Aug. 25 tournament at Beaverton's Howard M. Terpenning Recreation Complex ran into a "perfect storm" of events that brought together a bystander, an off-duty police officer and off-duty TVF&R firefighter/administrator -- soccer players all – to save the life of a Salem man. It all started as Kevin Fabrycki noticed teammate Ali Moghaddampour lying on the ground on an athletic field and immediately knew something wasn't right. "It didn't look normal," recalled Fabrycki, a homebuilder who lives in West Linn. "I could tell immediately he was in distress." While he only had the basic knowledge of how to perform CPR from a class he took long ago, Fabrycki had recently watched a YouTube video on the subject and sprang into action, beginning chest compressions. "I yelled, 'he's not breathing!'" recalled Fabrycki, during a recent reunion of the those involved held at the administrative headquarters of Tualatin Valley Fire & Rescue's in Tigard. Portland Police Bureau Officer Jason Hubert happened to be nearby as well and heard Fabrycki's cry for assistance. "So I went sprinting over there," said the PPB veteran who has spent the last 18 years with the gang enforcement unit. Allen Kennedy, a TVF&R North Division chief and seasoned paramedic, had seen Hubert sprint over to Moghaddampour and knew things were not right. 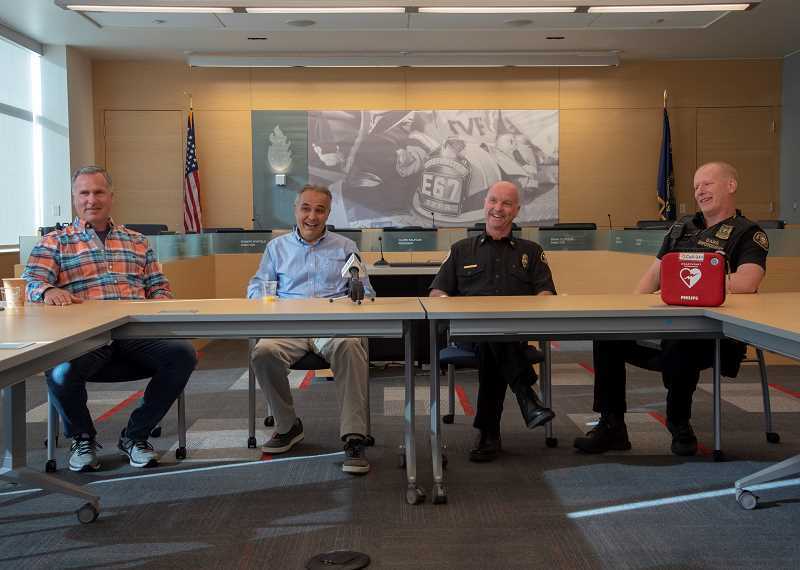 Hubert said together he knew they were in the process of doing an "amazing" job at performing CPR and the officer stopped only momentarily to allow a Beaverton police officer to perform the chest compressions. By chance, Kennedy had an automated external defibrillator, more commonly known as an AED, with him. The device was one of 300 given to off-duty firefighters through partnerships with PulsePoint Foundation, TVF&R and the firefighters' union, IAFF Local 1660. Kennedy recalled yelling for his players to call 911 and remembers Officer Hubert telling him, "Don't make me stop." "What he was telling me is he didn't want this person to die," said Kennedy, noting he then gave Moghaddampour two shocks with the AED. 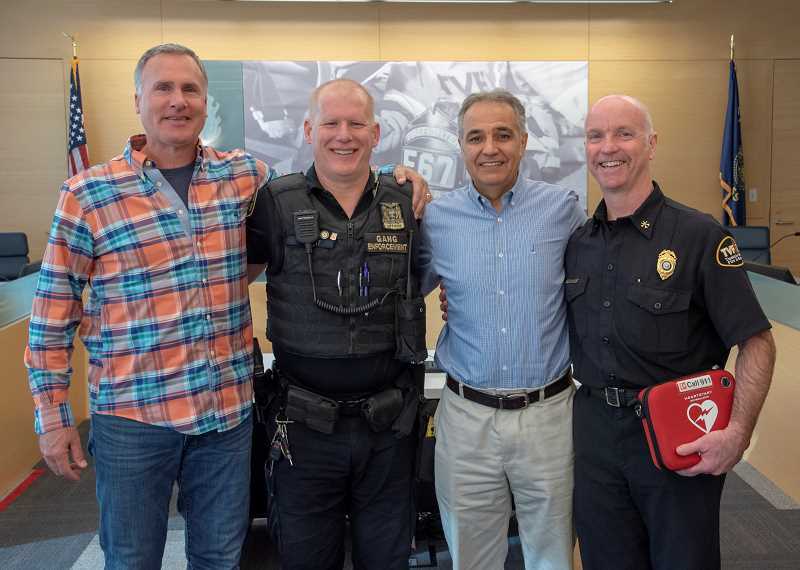 Kennedy said it was great to see all the emergency medical services coming together to help save Moghaddampour, a 59-year-old pharmacist who lives in Salem. For his part, Moghaddampour said he's extremely thankful for all those involved and praised the emergency personal who chose to become involved. "They're all busy and they put their lives on the line," said Moghaddampour, a seasoned soccer player himself who plays every chance he gets. "I think recognizing and getting involved is something we need to do," he continued. "We need to act, we need to look, we need to watch and we need to take care of each other." Moghaddampour praised bystander Fabrycki, calling it "beautiful" that he chose to get involved, and said he appreciated Officer Hubert keeping focused throughout the incident. 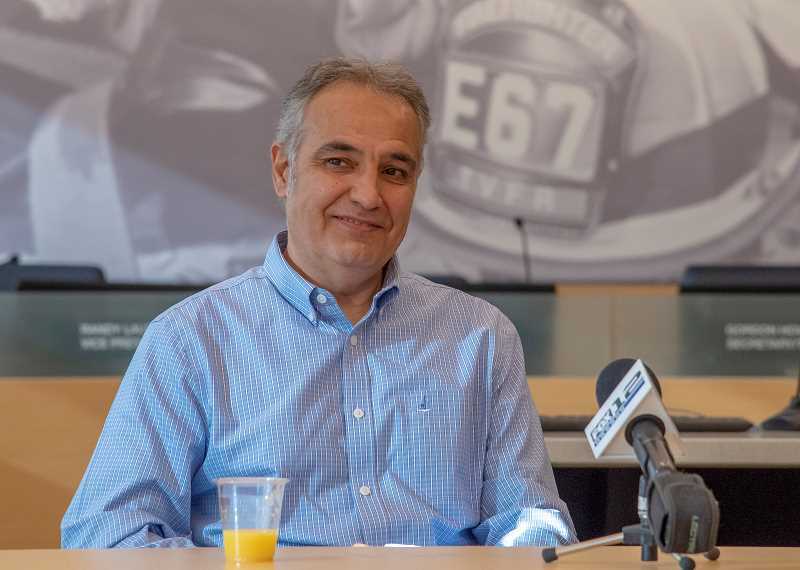 "He stayed with the task and he was positive the whole time," Moghaddampour said of the Portland Police Bureau officer. Moghaddampour said he's up and running again -- although not at full speed yet because of the heart medications he's taking. "I'm really pleased to be here and be alive," he said. "If there's angels, these guys are." He said the incident has made him all the more appreciative of his wife, two daughters and son as well as their concern for him. One of his daughters, who is attending medical school, calls her father a "miracle man." During the reunion, Brent VanKeulen, an EMS division chief, pointed out that approximately 450,000 people suffer sudden cardiac arrest per year in the United States. Of those, an estimated 350,000 sudden cardiac arrest incidents occur out of the hospital with half of those patients never showing any previous symptoms. In 2017, 30 patients in the TVF&R district had their lives saved as a result of having someone administer CPR, said VanKeulen. Fabrycki said he was amazed to watch everything unfold like it did during that August morning, calling everyone's actions calm and methodical. So does Fabrycki consider himself a hero? "I think anybody would have done the same thing," he said.